Distribution and habitat: Aphelandra squarrosa is a compact evergreen shrub growing to 2m (6 feet) tall in its native tropical habitat in Brazil. In the wild, it thrives in the high humidity and frequent downpours of the rain forest. 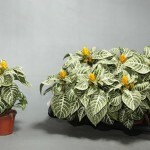 Description: Aphelandra squarrosa plants have glossy green leaves with bold white leaf veins. The dramatic leaves are ovate to elliptic growing up to 23cm (9 inch) long and 5cm (2 inch) wide within the center of the leaf and they have pointed tips. The plume of bright yellow flowers from yellow or orange yellow flower laden bracts up to 4cm (1.5 inch) long are an added attraction. The spikes appear at the top of the plant and sometimes there are additional spikes between the upper leaves. The small yellow flowers with attractive scent last for only a few days, but the cone-shaped spike of bracts remains attractive for 4 to 8 weeks. Potted plants usually grow to no more than 30-45cm (12-18 inch) tall on a stout stems and are best kept in pots no larger than 15cm (6 inch) in diameter. 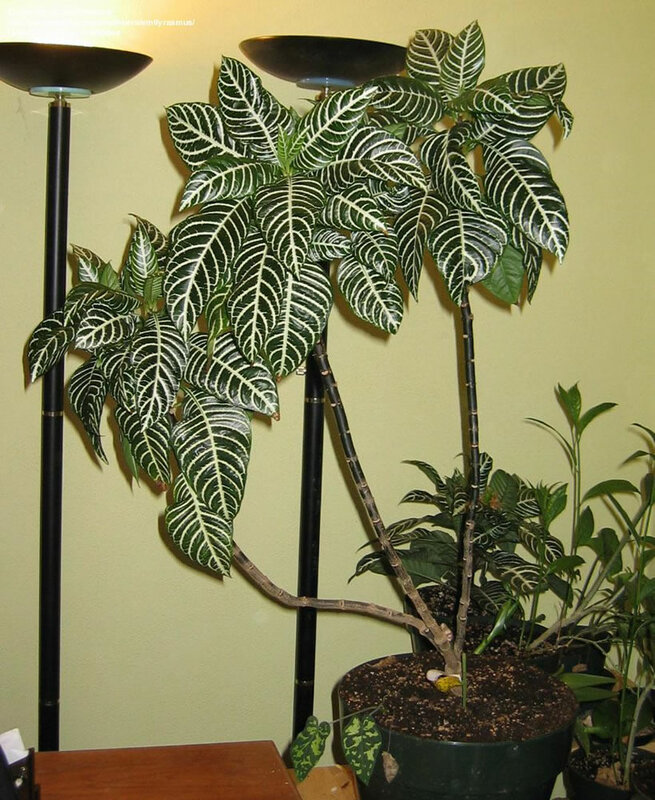 If properly cared for, the Zebra plant can grow as tall as 2m (6 feet) outdoors or a little over 30cm (1 foot) if kept indoors. 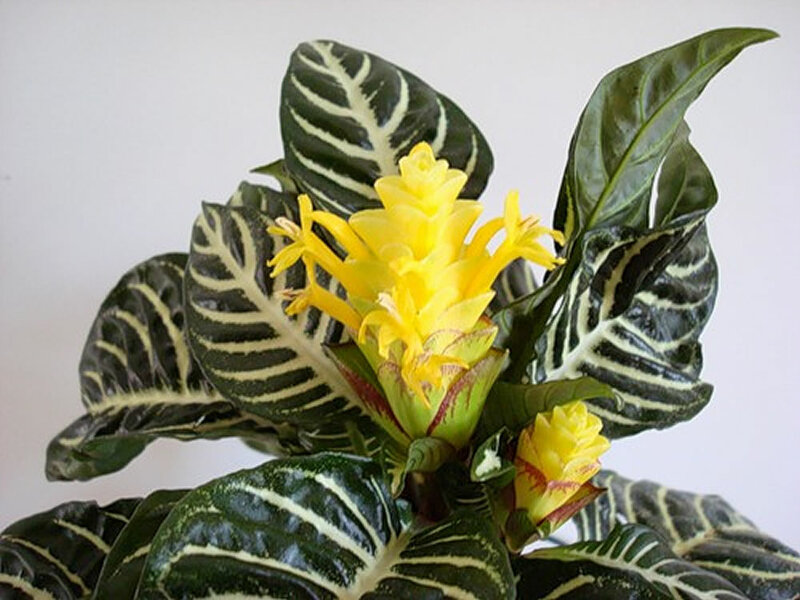 Houseplant care: Unfortunately, Aphelandra squarrosa are not easy plants to bring into bloom. They are usually purchased when in flower and will flower again only under the right conditions of light, temperature and humidity. 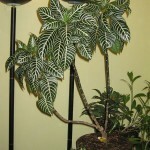 Keep the plant in a cool room for about 2 months during the winter rest. As light becomes more abundant in late spring, move plant to a bright place near a south or west window, but not in direct sunlight. Or, shift it to a shady porch or patio. When exposed to bright light for 3 months, Aphelandra squarrosa will usually rebloom in the fall, its natural bloom season. Light intensity rather than day length triggers flowering. This plant may not bloom when kept in low light, but it will earn its place with its exotic foliage. It will often bloom a second time during the year when given enough light. Aphelandra squarrosa plants are typically known to flower in the fall, but with care and attention, it can develop its distinctive yellow blooms at any time of the year. Cut off the bracts after they deteriorate and wipe leaves often with a damp cloth to keep them glow. 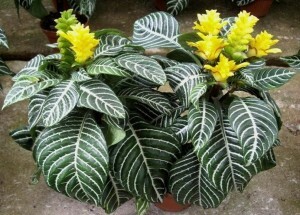 Light: Aphelandra squarrosa plants need bright light, but not direct sunlight. In spring and summer place the plant in bright light. In fall and winter give them moderate light. Temperature: Aphelandra squarrosa love warm temperatures: 18-27°C (64- 81°F). During the active growth period provide for Aphelandra squarrosa plants high humidity along with temperatures of at least 18°C (64°F). Pots should be kept on trays of moistened pebbles. Immediately after flowering, give the plants a short winter rest in a relatively cool position, but not below 12°C (54°F). Water: Keep the potting mixture constantly moist. Do not let this plant dry out. During the active growth period water plentifully as often as necessary to keep the potting mixture thoroughly moist. During the short winter rest period make the entire mixture barely moist, allowing the top half to dry out between waterings; this should be just enough water to keep the leaves from drooping. Maintain moderate to high humidity. use lukewarm water to keep soil temperature elevated. Mist frequently during growing season. Feeding: Aphelandra squarrosa must be given standard liquid fertiliser every week during the active growth period. Leach pots once during the summer. Potting and repotting: Use a soil based potting mixture incorporating peat moss or leaf mould. These plants can be moved into pots one size larger as necessary. Keep plants slightly rootbound. Most varieties will flower in 13-15cm (5-6 inch) pots. A plant that has flowered should be cut back to a single pair of healthy leaves every spring before being repotted in fresh potting mixture. This will promote flowering. As much of the old potting mixture should be removed from the roots as can be done without harming them. This treatment often results in the production of two or three main shoots per plant instead of only one. Longevity: Aphelandra squarrosa will live in home conditions for one to several years or indefinitely if propagated from rooted cuttings. 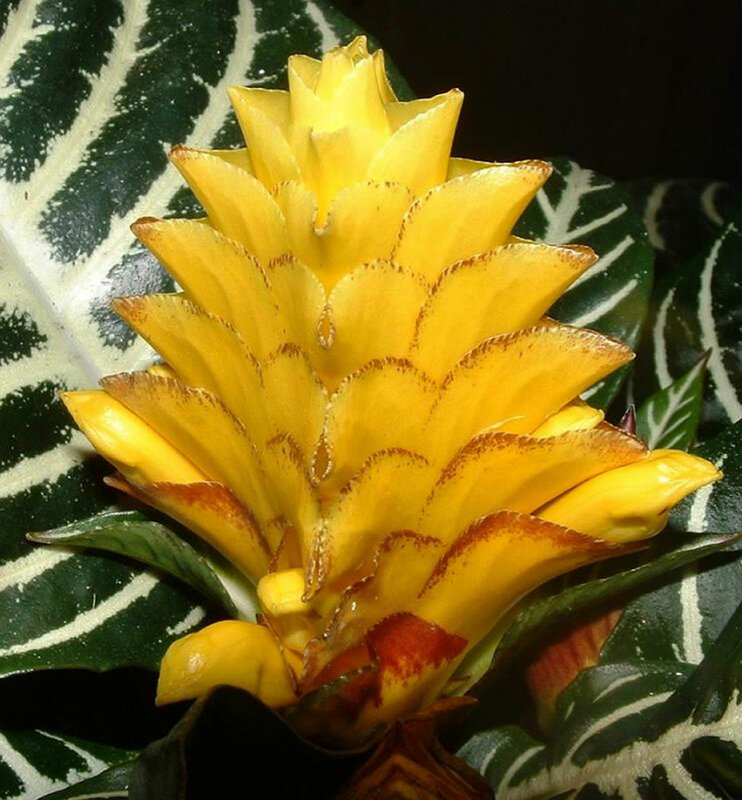 Gardening: Like many true jungle plants, however, the Aphelandra squarrosa plant poses a challenge to indoor growers in temperate areas. It requires lots of moisture, warmth and food to really thrive. Nevertheless, even a short-lived specimen is an interesting plant and can be expected to last for several months before it succumbs. 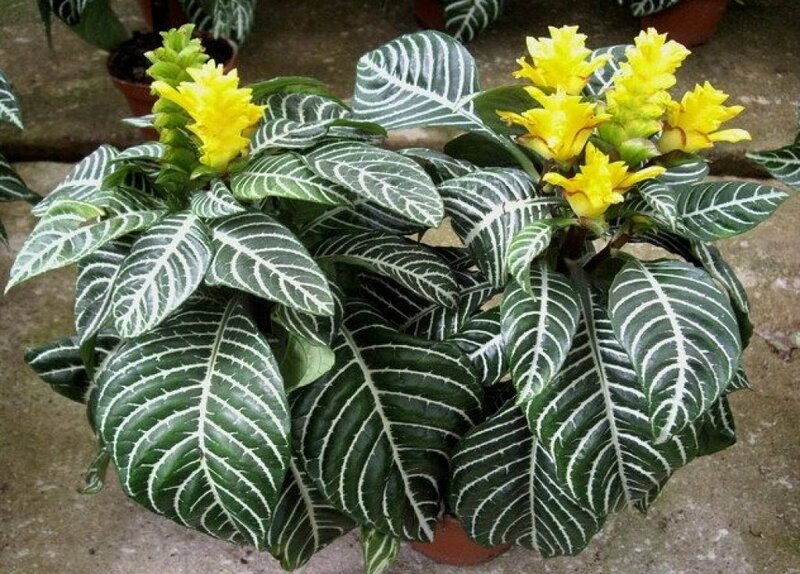 Location: Place Aphelandra squarrosa plants in a location that provides filtered light and protection from the hot afternoon sun. Plant these plants outdoors under trees that provide light filtering with leaf cover. Soil: Aphelandra squarrosa plants like rich soil that retains water, but drains well. Plant Aphelandra squarrosa plants outdoors in a hole that is twice the size of the plant’s root ball and the same depth as the container the plant is presently in. Add compost to the hole to increase moisture retention. Remove the plant from the container and separate the roots. Place the plant in the hole and fill with soil by lightly packing it around the plant. 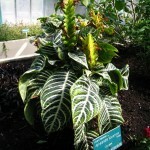 Irrigation: Water Aphelandra squarrosa plants regularly so the soil is moist, but not wet. Water generously when the top 2 inches of soil become dry. Check the plant regularly as environmental factors affect soil dryness. Mulch outdoor plants to maintain soil moisture. Plants should be watered a minimum of once a week when there is less than 2.5cm (1 inch) of rainfall per week. 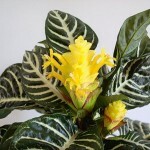 Fertilise: Fertilise Aphelandra squarrosa plants every two weeks with a water soluble fertilizer that is quick release. Provide a winter rest period by not fertilising during the winter months as this will initiate new bloom growth. Propagation: Propagate – preferably in late spring – by means of tip cuttings 5-8cm (2-3 inch) long. 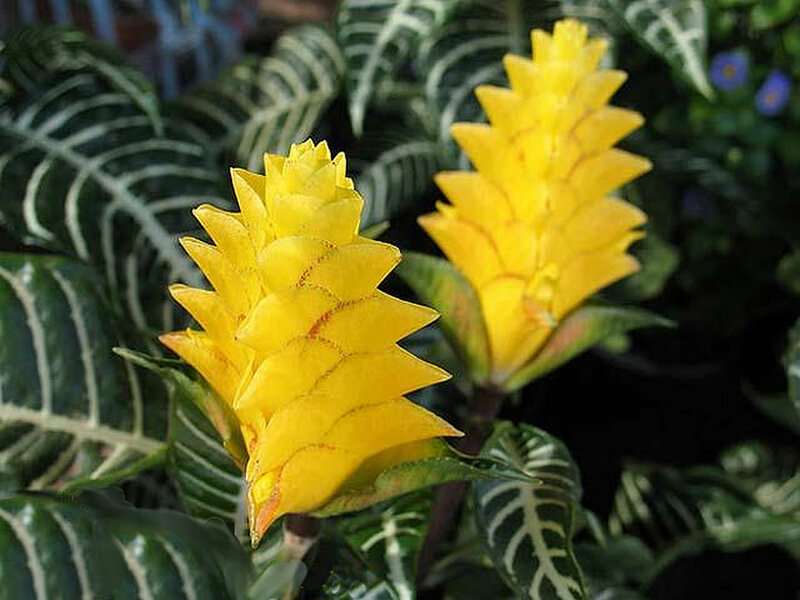 Plant them in potting mixture recommended for mature Aphelandra squarrosa, moiten it well, enclose the whole in a plastic bag and keep it in a warm, humid place in bright light filtered through a translucent blind or curtain. No further watering is necessary. Cuttings should start to root in six to eight weeks. 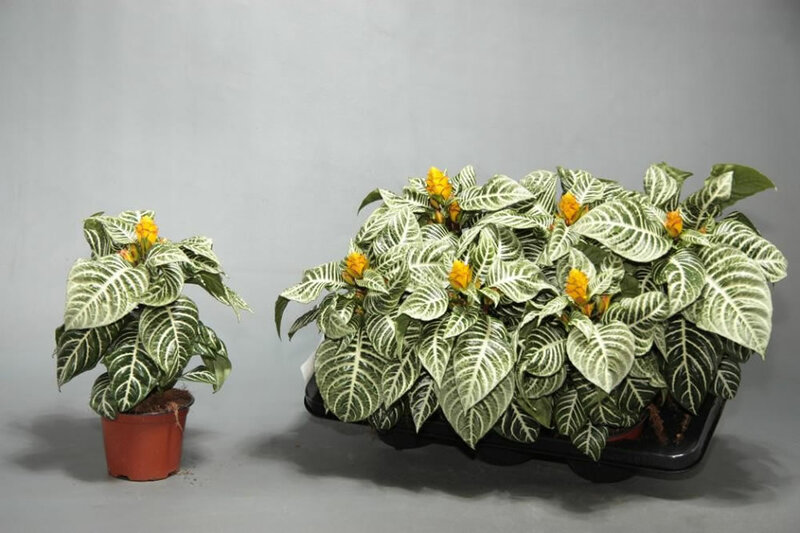 Problems: Though it prefers humidity, the Aphelandra squarrosa plant can die if it gets too much water, as well; misting with a light application of water every day is appropriate for its needs. Cold environments will kill it, as it grows best in temperatures that fall in a fairly narrow range: 18 to 21°C (65-70°F). Leaves become crinkled or curled. This can be caused by too much light. Treatment: Move plant to a shadier location. Growing tips wilt because the potting mixture is too dry. Treatment: Aphelandra squarrosa requires constant moisture which can be a challenge in summer when the plant is kept in bright light. Rehydrate pots that may have dried out in the center. This often happens with rootbound plants grown in a peaty potting mix. Lowest leaves wilt and drop off is caused by too dry, too wet or excessive fertiliser. Treatment: Maintain constant moisture and reduce strength of fertiliser solution. Leach pots to remove possible accumulated salts. Small yellow spots on leaves; tiny flying insects are present. This is caused by infestation with whitefly. Treatment: Isolate plant and install sticky traps. Remove and destroy badly infested plat growth. Keep plants clean at all times and use an adequate pesticide regularly. Plant is weak; grows slowly; small flying insects present. This is infestation with fungus gnats. Treatment: The moist, peaty soil Aphelandra squarrosa prefers is attractive to this irritating pest. Keep soil slightly dry for several days, then trap larvae with potato pieces placed on the potting mixture. White cottony masses on stems are caused by mealybugs. Treatment: Remove mealybugs with a cotton swab dipped in alcohol or vegetable oil. Use an adequate pesticide. Small sucking insects on leaf undersides and new leaves are caused by aphids. Treatment: Clean plant thoroughly with water, then spray with insecticidal soap. 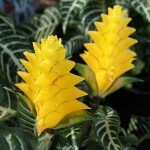 Aphelandra squarrosa ‘Louisae’ is a compact form with leaves 20-30cm long and with broad yellow or orange-yellow flower bracts. Aphelandra squarrosa ‘Brockfeld’ is compact with dark green leaves. Aphelandra squarrosa ‘Dania’ has silvery leaf margins. 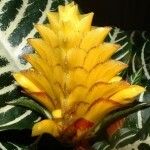 It is the most difficult Aphelandra squarrosa plant to bring into bloom. Aphelandra squarrosa ‘Fritz Prinsler’ has sharp leaf colour contrast. Aphelandra squarrosa ‘Red Apollo’ features stems and leaf undersides blushed with red. Aphelandra squarrosa ‘Apollo’ is another cultivar with white dramatic venation. 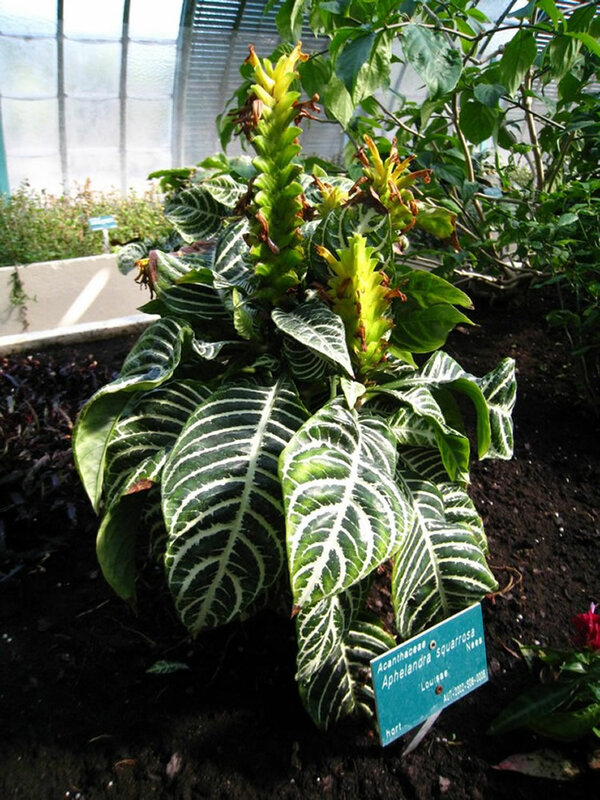 Uses and display: Aphelandra squarrosa are used for foliage display as well as for their showy spikes. This plant thrives best in a highly humid environment, making it ideal for bright bathrooms and greenhouses. Outdoor gardens in humid climates are also highly conducive for the Aphelandra squarrosa plant. Display in a prominent place in fall when the plant is in bloom. Also, Aphelandra squarrosa are good plants for terrariums.